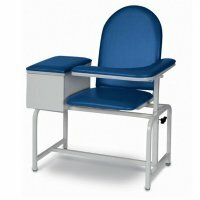 Blood Drawing Chair - Basic / Padded, Winco Blood Drawing Chairs featuring infinitely adjustable armrests, durable plastic resin seat, non-marring leveling feet, and coordinating, easy to clean, gray formica. 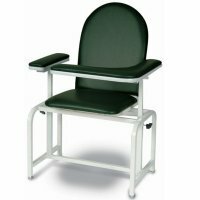 The flip-up contoured urethane armrest provides comfort, easy access, and added safety for the user. 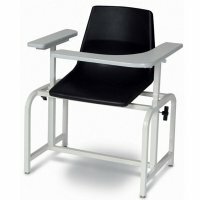 The Basic Blood Drawing Chair, by Winco, has a weight capacity of 300 lbs. Available options and accessories include an IV Pole, storage drawer, single pivot arm, single pivot arm and storage drawer and dual pivot arms (no cabinet). 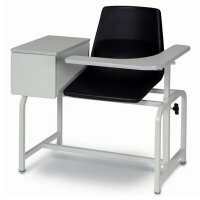 The Winco Padded Drawing Chairs feature a vinyl upholstered seat and back and are available in an array of color choices. 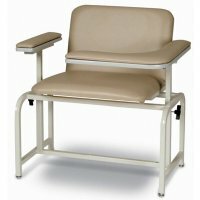 These chairs also offer all of the options and accessories the basic chairs offer plus choose from the standard weight capacity of 300 lbs or choose our Winco XL Padded Blood Drawing Chair with an added weight capacity of up to 450 lbs.